His warmup dance on the mound and his theatrical leadup to his pitch were absolutely everything. 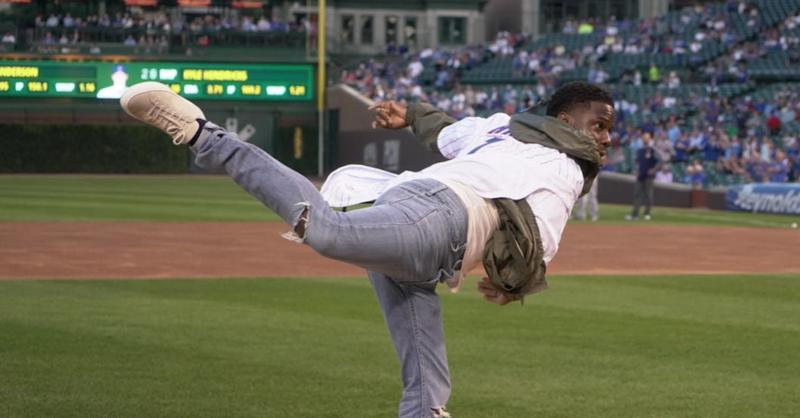 The “Central Intelligence” star showed off his normal hilarious antics, but after a massive wind up on the mound, the ball just rolled into the catcher. Womp. On his Instagram, Kevin clearly hinted at the fact that his “273mph fast ball” left little to be desired. But we have to say, his form was excellent and he continues to provide serious entertainment at ballgames. Earlier this summer he threw out the first pitch at a Dodgers game in Los Angeles with Kourtney Kardashian. In that side-by-side matchup he seemed to nail it! We still love you Kevin. We just wonder what The Rock would think of this!? WATCH: Kevin Hart & Tiffany Haddish Throw Serious Shade At The 2018 MTV VMAs!